A few years ago, I filmed myself drawing some celtic knots for my YouTube channel (back in the day when I was trying to vlog regularly). Since then I've had a small but constant stream of people asking me to make an actual tutorial. I'm still very much learning myself, but after several years of being ridiculously obsessed with celtic knotwork and other ornamental patterns, I think I've got a grip on the very basic techniques. In trying to teach my little sister I realized that some of the techniques I used could be simplified by drawing basic celtic knots (rectangularly-based) with thick markers. Part Two deals more with the walls, which split the celtic knots up and make the really cool, interesting designs. It shows how primary grid walls always bounce the bands, whereas secondary grid walls sometimes create interesting lines and loops. I really recommend that you sit down and try to copy the knots in the videos; the concepts usually don't "click" until you experiment on your own! I wanted to share some pictures of Elvish jewelry I've made in the last year! (These aren't up on my Etsy shop; a majority of these were personal projects or for gifts). It should by now be pretty obvious that I absolutely love The Lord of the Rings and that the aesthetics of both the books and the movies (and illustrations by geniuses such as Alan Lee) are hugely influential. Also, as a typography and sort-of literary nerd, I am in love with the beauty of the Elvish alphabet which Tolkien developed. I haven't yet perfected the process of making these etched cuffs; the process is long and convoluted and so far has approximately a 50% success rate on a piece which can take up to two hours of hands-on work per bracelet, when making them in batches. It begins with a sheet of raw copper, which I cut on the bandsaw and both drill and preliminary sand with the drill press. Then I file and sand each cuff by hand to remove any metal burrs or roughness, and attack it with steel wool while wearing plastic gloves to remove any grime or fingerprints. 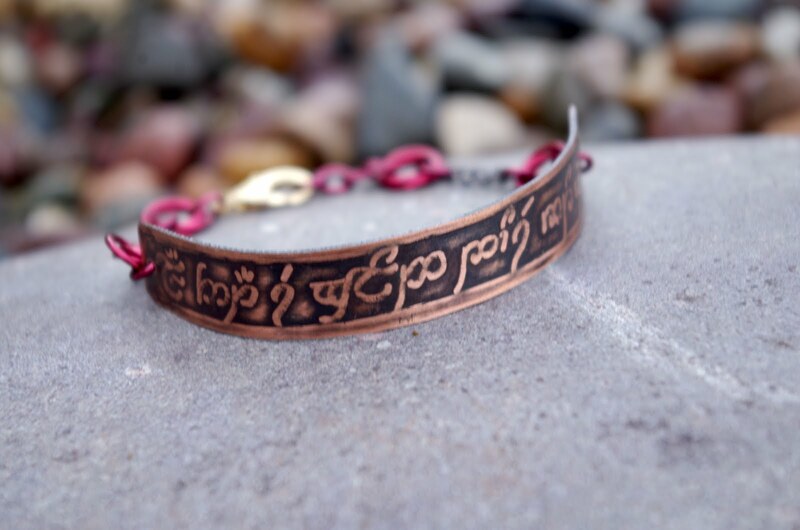 I then write the Elvish and English quotes on the copper with a wet Sharpie. After the resist had dried, it's time to suspend the cuff in an etching solution of hydrochloric acid and peroxide. Over the next several hours, I occasionally stir the acid to assist the etching process. If the etch is crisp and deep enough, I remove the copper while wearing protective gear, neutralize the acid, scrub the piece with steel wool, rinse it, and submerge it in a Liver of Sulfur solution. The LOS oxidizes the copper, turning it a rich brown or black. Once the desired color is achieved, I neutralize the LOS and allow the piece to dry for fifteen minutes. Then for the finishing touches! I gently sand the piece with three different grits of micro-sandpaper so that the words shine brightly on the oxidized background. 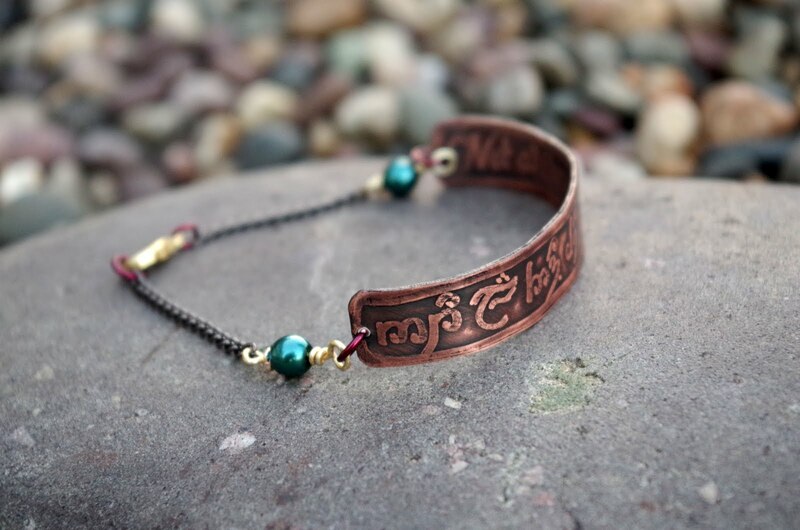 I form the copper strip into a bracelet shape and coat all sides with a jewelry resin. The resin ensures that the piece retains the oxidized and sanded color, and also prevents the copper from turning skin green. The resin dries overnight; when its ready, I add the beads, chainmaile, chain, and clasp! 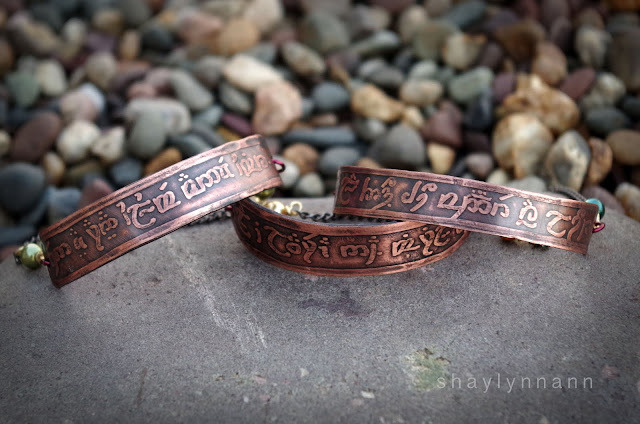 Hopefully in what remains of this summer I will be able to perfect the process and create some Elvish cuffs to stock on my Shoppe! 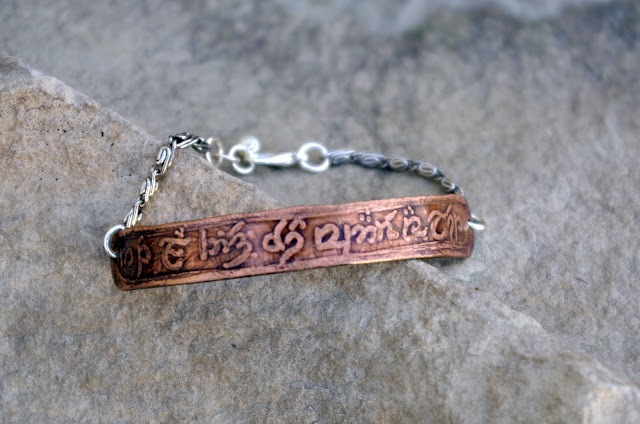 Do you have any favorite (public domain) quotes that you would like to see in Elvish on a cuff? Please let me know in the comments! (The cuffs will have English quotes which are transcribed into Tengwar, the Elvish script, rather than being translated into Quenya or Sindarin, the Elvish languages). Lately I've also been working on the process for these little metal booklet necklaces! This one has the entire Aragorn poem on it. The process is similar to the creation of the Elvish cuffs, except that the words on the brass pages are stamped letter-by-letter, and I cut the jumprings myself so that the diameter of the rings on the binding is just right. The worst thing is when I hammer in a letter too hard or hold a stamp upside-down or backwards-- and entire page of the book has to be started again from scratch! But I'm really enjoying the process of figuring this out and will be making more little metal booklets this summer. 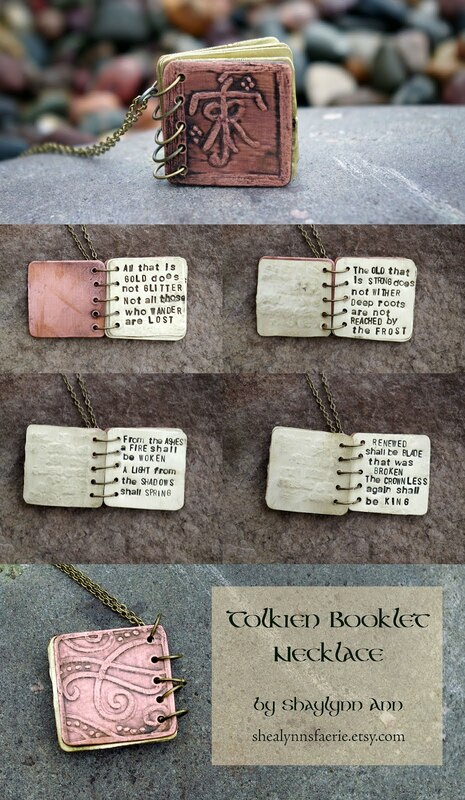 (Currently I have Jane Austen and a G.K. Chesterton booklet necklaces available). Another booklet experiment! This one is made entirely from copper and features the same poem. However, the verso pages feature Elvish etchings! 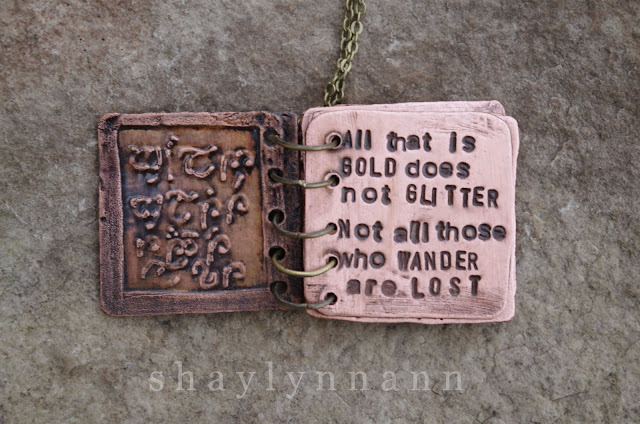 Each capitalized word (gold, glitter, wander, lost) is featured. But here you can see how much difficulty I am having with consistent etches. 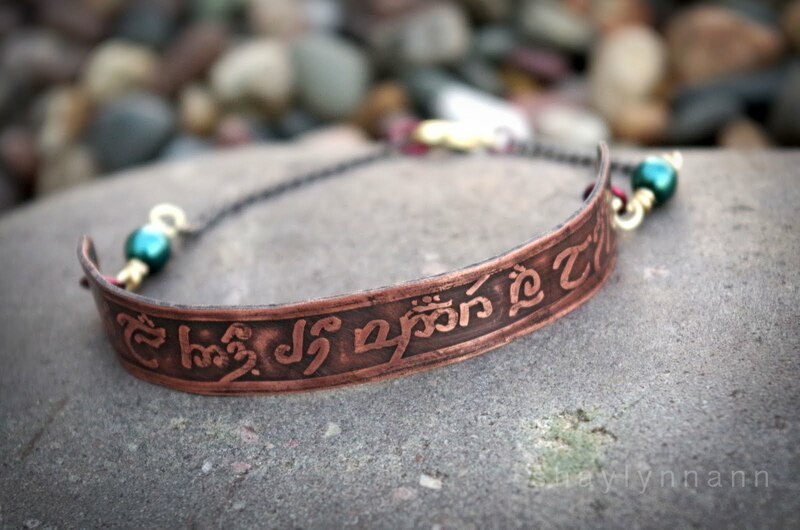 You can barely read the Elvish! 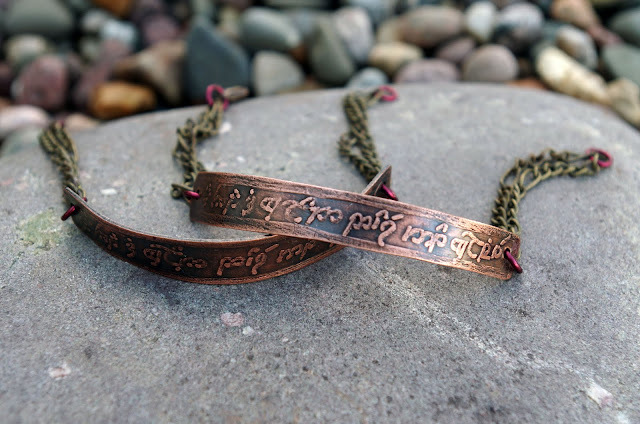 These are some shots of other Elvish cuffs with more verses from "All that is gold..."
And the bar necklace pictured above is made in the same way, and reads "The Road Goes Ever On" in both English (backside) and Elvish. 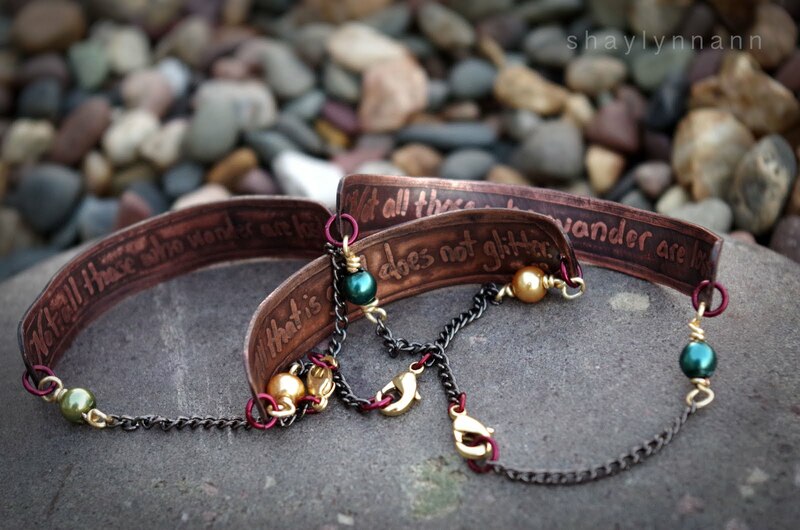 This necklace was a custom piece-- and I neglected to photograph the backside. 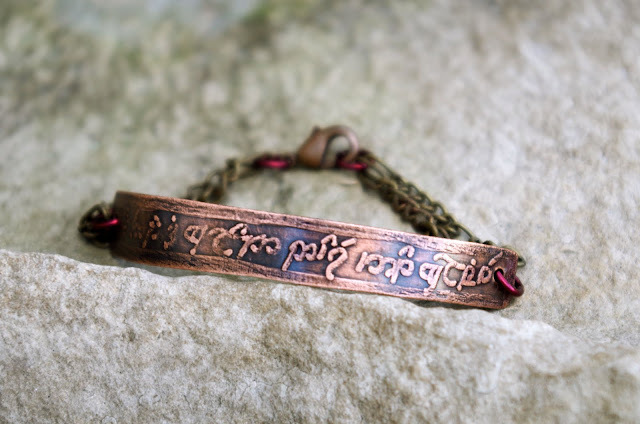 The copper pendant has Tolkien's initials etched on it, and the back had a quote. 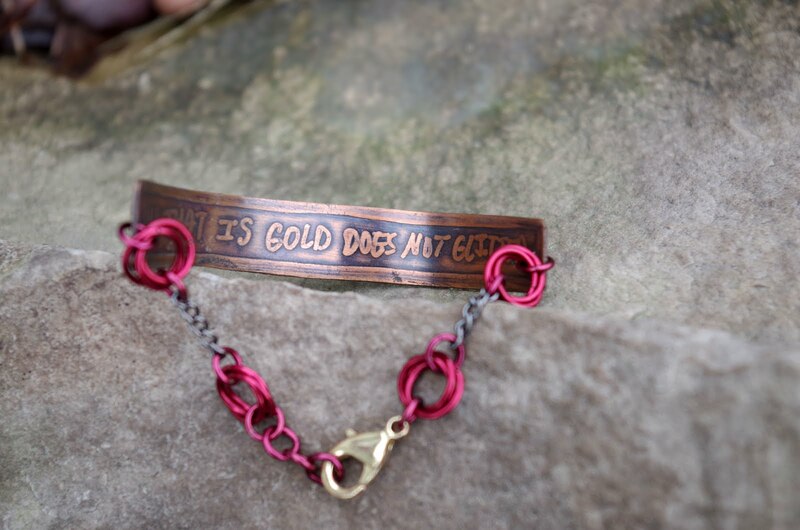 The necklace is made from two strands of chain interspersed with wirewrapped beads. 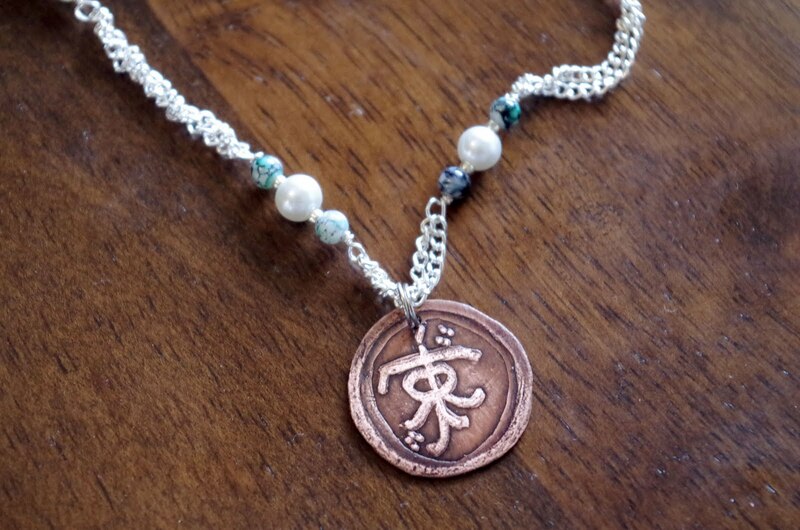 Another one which I didn't photograph properly-- this necklace is inspired by Arwen Undomiel, the daughter of Elrond, who gives up her Elven immortality in order to marry Aragorn, a human. In the movies, she gives Aragorn a necklace (the lovely silver Evenstar) to symbolize her gift. He protests, and she responds, "It is mine to give to whom I will, like my heart." The necklace is paired with a full cuff (no chain and clasp) which contained the lines "I would rather spend one lifetime with you than face all the ages of this world alone." 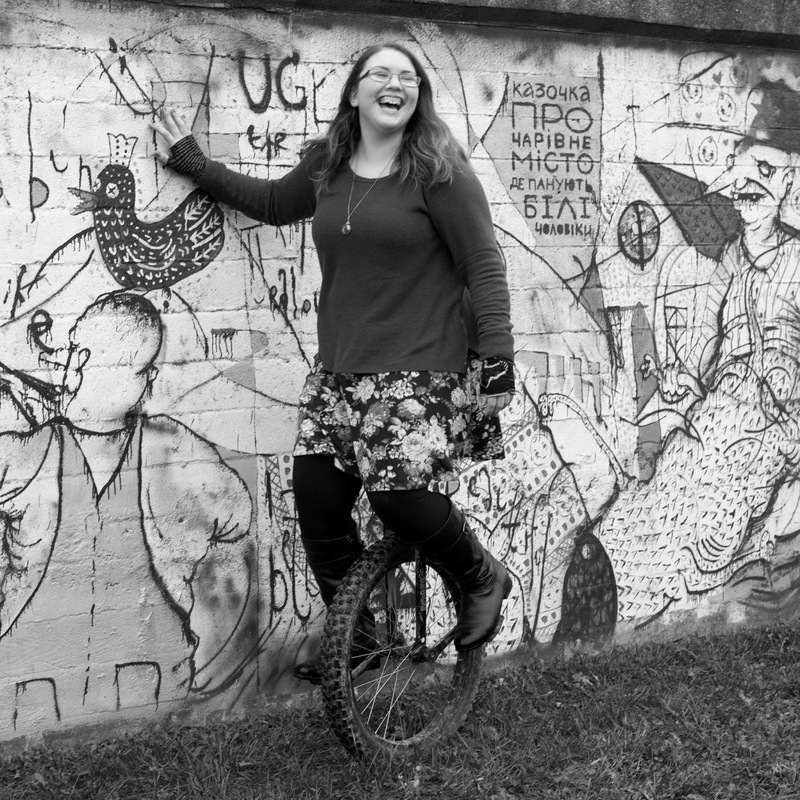 Also, three cheers for nerds! I get to make the best jewelry sometimes. :) This custom piece has another beautiful LotR quote: "Faithless is he who says farewell when the road darkens." 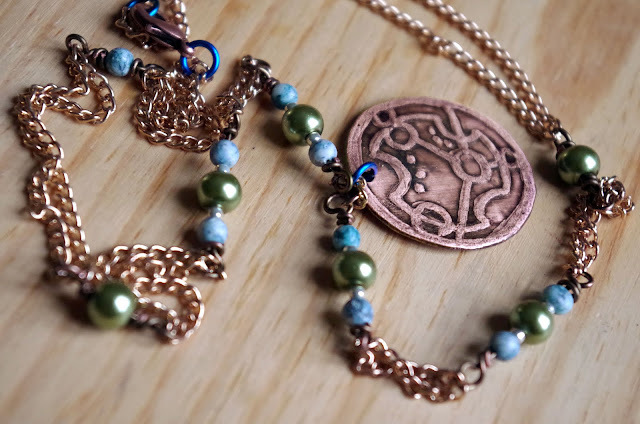 ...and the back of the pendant has the recipient's name etched in Gallifreyan! Please leave quote suggestions in the comments! Thanks!